Today is World Meteorological Day. Organised by the World Meteorological Organization (WMO), the theme of this year’s day is: hotter; drier; wetter; face the future. These themes help to illustrate changes already observed in the world’s climate, and they also signpost areas of future concern. As widely reported at the beginning of this year, scientists from the Met Office Hadley Centre and the University of East Anglia’s Climatic Research Unit showed that 2015 was probably the warmest year in a series dating back to at least 1850. 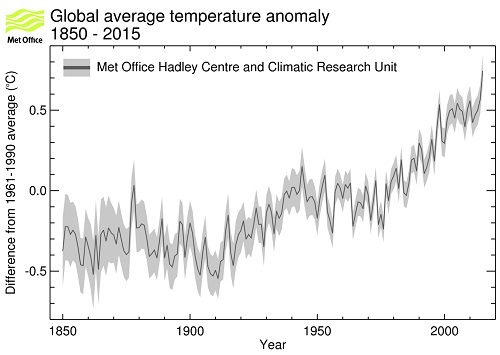 Temperatures during 2015 were 0.75°C ±0.1 °C above the long-term (1961-1990) average. When compared with the pre-industrial period, the 2015 average global temperature was around 1 °C above the long-term average from 1850 to 1900. In 2015, the global mean temperature reached record levels in a series of records dating back to 1850. Dr Peter Stott is head of climate monitoring and attribution at the Met Office Hadley Centre. He said: “2015 was a record-breaking year for our climate. Global mean temperatures reached 1 °C above pre-industrial levels for the first time and the year’s average global temperature was the highest ever in instrumental records.” The Met Office cites 1850-1900 as the most reliable reference period for pre-industrial times. The effect of weather and climate in one part of the world can strongly influence what happens in another. With many parts of the world affected, El Niño is just one single, yet powerful, example of why it’s necessary to take a holistic view when looking at weather and climate. Compared with the average for 1961-1990 there was variation of temperatures at the surface during 2015, with some areas, such as Siberia, being much warmer and parts of the North Atlantic being colder. The WMO is a specialized agency of the United Nations (UN) with 191 Member States and Territories. It was established in 1950, based on the International Meteorological Organization (IMO), which was founded in 1873 to share weather information between countries. Today the WMO is the UN system’s authoritative voice on the state and behaviour of the Earth’s atmosphere, its interaction with the land and oceans, the weather and climate it produces and the resulting distribution of water resources. To find out more about World Meteorological Day and the impacts of extreme weather events during 2015, please visit the website. This entry was posted in Met Office News and tagged climate, climate change, Met Office, weather, World Meteorological Day, World Meteorological Organization. Bookmark the permalink. 2015 was only a record warm year in the temperature adjusted, homogenised, UHI challenged surface records maintained by the Met Office/UEA. According to the more accurate NASA UHA satellite records it was only an unspectacular 3rd warmest year since 1979. Even then this was only achieved as a result of the current El Nino conditions. The Met Office are becoming ever more desperate to push their global warming propaganda before the inevitable La Nina sets in. NCEP (National Climate And Environmental Prediction) CFSR doesn’t agree with the Met Office either JB. NOTE: the above links directly to NOAA/CIRES. To view CFSR you must select “CFSR (1979-2015)” as the chosen data set followed by “plot”. In the discussion the usability of NCEP/CFSR is shown below. Simply copied and pasted. State-of-the-art 3rd generation reanalysis with robust physics and data assimilation. Includes coupled ocean and sea ice models. 0.5°x0.5° global grid with 64 vertical levels. 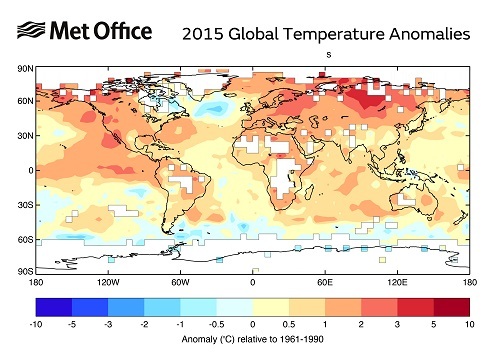 NCEP/CFSR has 2015 as the fifth warmest year on record, not the first. I see you are still trying to win the prize for responding first to the highest number of posts. I hope the Met Office do actually have a prize. Perhaps they will send you some global mean temperature data. So even if you (incorrectly) believe the that the satellite record is a better indicator of climate change (a subject also covered in previous exchanges), then it is still showing record warmth. There is no escaping it: whether you look at the surface or the satellite data, or a whole host of other things, the atmosphere is warming up. I’m not sure why but you’re confusing weather with climate.